A haunted house isn’t the only thing quickening Alexi’s pulse . . . - Alexi Jordan has come to the old Florida estate to heal the wounds left by a bad marriage – and runs straight into trouble. She doesn’t mind the fact that the mansion was supposedly haunted – after all, she can look after herself. It’s the feelings stirred by her neighbor Rex Morrow, who seems intent on being her protector, that’s giving her the jitters. Alexi chose the wrong man once before; can anything be scarier than the thought of her doing it again? Confederate soilder who hides treasure for his wife in case he doesn't make it home. He knew he was going to die and he planned to help the woman he loved more than life itself. His descendants now live in the house and someone knows the treasure is there & they want to find it before Alexi does. This is more a romance than a suspense/paranormal book. 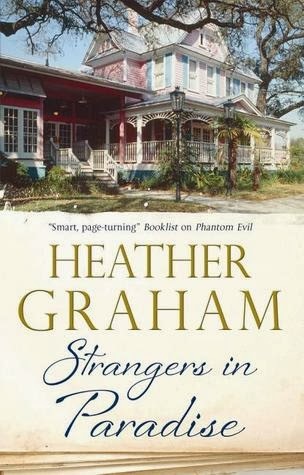 No hints of ghosts until the very end, since this was written in the 80s some of it's age shows thru, like payphones instead of cellphones; & Rex's attitude which sometimes borders on the not so awesome (but does make him sound a lot like another southerner, yeah he sounded like Rhett). Overall it's a pretty good book, short, fast, engaging read. Their love was beautiful to read about. It's not as suspenseful as her other books, and certainly doesn't have as much paranormal haunting as it should if it wanted to fit that genre. I would suggest getting it at the library, it's a quick read, great for a rainy day.